This innovative backup feature allows users to backup files instantly to their NAS, external hard drive, or remote NAS. RTRR saves time as it is able to back up data immediately. Data Guard Backup Solution is the ultimate NAS module as it provides both local and remote support. Currently, it allows for data to be backed up across RAID volumes, external USB drives, and eSATA. Data Guard also uses innovative technology to sync data across the network to other NAS and servers. NAS data can now be burned directly to CD, DVD, and Blu-ray discs. This hassle-free module makes burning data to a disk effortless. Burning ISO image files is also supported. Whether you’re managing audio, media, or essential files, Data Burn copies information quickly while significantly improving backup efficiency. 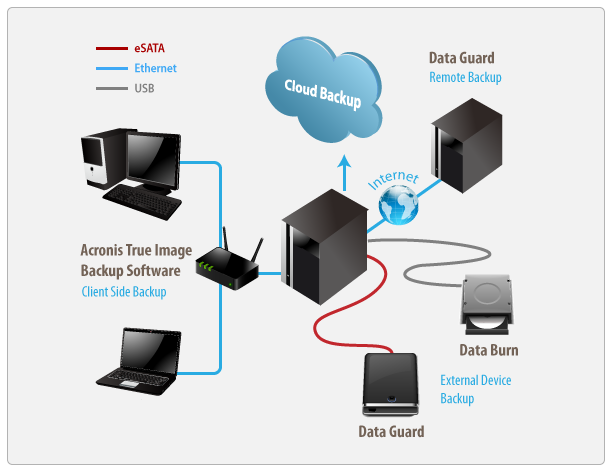 Thecus brings the best to the table with Acronis advanced backup software. Back-up all your data with One-Click Protection or pick and choose your most important files. Acronis sports a slick interface, user-friendly design, and comprehensive features designed to keep your data safe. Backing up data to the cloud allows businesses to access their data from anywhere in the world. All Thecus® devices thus support easy data downloading and uploading as the cloud is accessible wherever there is an internet connection.